백자 상감모란문 매병(白磁 象嵌牡丹文 梅甁)은 고려시대 만들어진 백자 매병으로 높이 29.2㎝, 몸 지름 18.7㎝이다. 각 있게 세워진 두툼한 아가리와 팽배한 어깨 선은 몸체를 지나 밑부분까지 사선으로 줄어들어, 중국 북송의 영향을 받은 듯 하다. 몸체는 참외 모양으로 6등분해서 세로로 골을 만들었으며, 각 면에는 마름모 모양의 선을 상감으로 처리하였다. 그 안에는 청자 태토로 메꾸고 붉은색 자토와 흰색 백토로 모란, 갈대, 버들이 늘어져 있는 그늘에서 물새가 거니는 모습, 연꽃 등을 상감 처리하였다. 아가리 가장자리와 굽 둘레는 연꽃 잎을 도드라지게 돌렸고, 다시 청자 태토로 상감하여 백자에 청자 태토를 적절히 이용한 특이한 문양 효과를 내었다. 고려 청자와 백자를 하나로 혼합하여 완성한 희귀한 도자기로, 전례를 찾아 볼 수 없는 중요한 작품이다. This vase is 29.2 cm in height, 18.7 cm in diameter, and typical of Goryeo prunus vases, having a line passing a plump shoulder and a slender. It is estimated to have been influenced by the Northern Song Dynasty of China judging from the standing thick mouth at an angle and the surging shoulder line becoming narrow obliquely along the body and the bottom. The melon-shaped body is divided into 6 blocks perpendicularly and on each segment a lozenge-shaped frame is inlaid. The inside is filled with celadon clay lotus flowers, and waterfowl relaxing in the shade of a peony. Reeds and willows are inlaid with red and white clay. 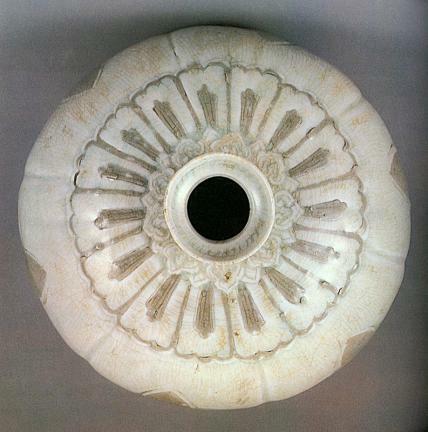 The mouth and base are encircled with lotus flowers inlaid with white clay, and the white porcelain with celadon clay gives a special design effect. 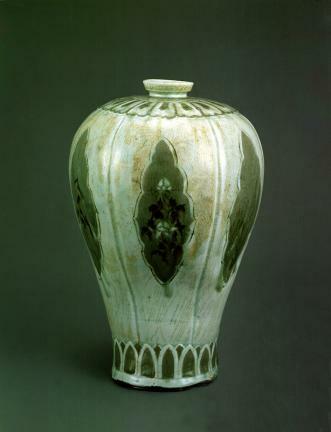 This rare piece in which Goryeo celadon and white porcelain are mixed together is more precious than any earlier work.